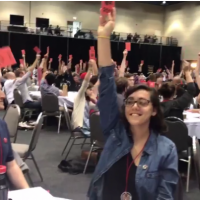 It’s no surprise that the Democratic Socialists of America, endorsed a Boycott, Divestment and Sanctions (BDS) policy at its recent membership convention. Disheartening, yes, but today’s DSA, though calling itself the ‘largest socialist organization in America’ is not the DSA that was founded by Michael Harrington, Irving Howe, and others – including me – several decades ago. It is now an organization whose ranks are swelling especially with younger activists excited by the Bernie Sanders’ presidential campaign in the US, the Jeremy Corbyn leadership in the UK Labour Party, and by ultra-leftists like France’s Jean–Luc Mélenchon. In the international sphere, its socialism is more concerned with ‘anti-imperialism’ than the democratic socialism that inspired the founders. Indeed, it’s no accident that at this same convention, the DSA delegates voted to end its long-standing membership in the Socialist International (SI), a global organisation of mostly social democratic and labour parties that hails back to the Second International. The SI was formed in the late 1880s by social democratic parties like the German Social Democratic Party whose promotion of a social welfare state once represented a hey-day for a European social democracy that has since found itself in a policy and identity crisis. Historically, the SI played a key role in promoting Israeli-Palestinian negotiations, back in the days when the Israelis and the Palestinians were not in public conversation. Bruno Kreisky, a Jewish former president of Austria and leader of that nation’s social democratic party, was perhaps the most visible leader forging these ties, but the French, Scandinavians, and Germans were also active in this arena. Early supporters of back channel peace efforts like Palestine Liberation Organization (PLO) moderate Dr. Issam Sartawi were often found at SI party congresses, seeking conversation and attempting to move things forward. Sartawi, a Yasser Arafat ally, was murdered in daylight in a Portuguese hotel lobby in 1983 by a radical break-away faction from the PLO, the Abul Nadal organization. Sartawi, the liaison from Arafat to Israeli peace groups, was invited to the SI conference as the guest of Portuguese Social Democratic Prime Minister Mario Soares. Michael Harrington was in the hotel lobby at the time and, as he told me and others, this episode was seared into his mind. Harrington was a deep believer in Israel – and its socialist roots. He took his friendship with Shimon Peres seriously and even found himself sometimes on the right of those of us within DSA who supported Israel but strongly supported a Palestinian state, too, at a time when Peres was still advocating for a Jordanian option. It’s unlikely that he would have felt at home were he alive, in the organization he founded. Indeed, based on this issue and others. it’s not even clear to me that he would have been welcomed in today’s DSA. Largely due to its roots in the older democratic socialist left, and influenced by what was still the relative strength of the Israeli social democratic left, the links between the US and Israeli leftists’ in the 1970s-and 1980s were strong. While DSA was much smaller back then (under 10,000 members to today’s 25,000), it was home to a circle of Jewish professors and writers who were among the leading intellectual voices for a moderate left that also forged international ties with the anti-Stalinist left around the world. But that global democratic left is now greatly diminished, and there is perhaps no nation where this diminishment is more obvious than in Israel. The absence of a strong, vibrant and consistent democratic left-wing opposition to the Israeli occupation is one of many factors that has led to the field being yielded to activists who are promoting BDS. Unfortunately, even Israeli civil society, where there are many anti-occupation groups (several of which I have supported over many years), doesn’t have the long reach that the pro-BDS activists have achieved in recent years. Couple this with the emergence of a younger, more ‘anti-imperialist’ left that sees the centrist politics of their socialist predecessors nearly as much a part of the problem as the more mainstream democratic leaders (and former US presidents on this issue), and you have a perfect opportunity for those pushing BDS. I believe BDS only takes Israel and the Palestinians farther away from a two-state solution, especially since the resolution passed by the DSA – like many others pushed by BDS supporters – does not explicitly support the right of Israel to exist as a Jewish state, leaving open the path to a bi-national state, which is the actual aim of the leadership of the BDS movement. And, there’s something else. As in many other fights around BDS, like those in the religious denominations, civil rights coalitions, trade unions and on university campuses, activists from the group Jewish Voice for Peace (JVP) have taken an outsized role in promoting BDS. Where historically there would have been activists affiliated with the once strong Israeli kibbutz or social justice movement fighting within the ranks of DSA, most of those slots have now been ceded to the young activists of JVP, an organization that promotes BDS by telling non-Jewish allies that it is ‘okay’ to oppose Israel because they will still have Jewish allies in JVP, even if they lose many other allies. From my reporting, it doesn’t seem that JVP was the deciding force that brought BDS to the forefront in DSA. Nor was it the Palestine Solidarity Campaign or any of the other pro-BDS efforts, though activists from these organizations helped promote it internally and hailed its passage. There is indeed a lesson here – the anti-BDS campaign that engages much of the organized Jewish community and is promoted by the Israeli government is simply not effective when the struggle against BDS is on the left. In fact, many of these highly publicized efforts exacerbate the situation. Anti-BDS efforts can only be won by the left arguing among itself – those of us who have been fighting on this terrain know this by painful experience. There must be strong refutations against BDS that also defend Israel’s right to exist while clearly repudiating the occupation, continued settlement growth, and by calling for a Palestinian state. Ties must be strengthened between pro-Israeli progressives and Palestinian activists. The continued actions of the present Israeli government – including the intentional blurring of any border line while strengthening the settlements–will only lead to further support among the global left for pro-BDS efforts. Increasing anti-democratic moves by the sitting Israeli government, attacks on religious pluralism and shared society and on the very cultural freedom that allows Israel to stand out as a democracy in that region greatly exacerbate the situation, too. Meanwhile, for DSA, a box was checked and a statement was made, alienating many of us who had a home in this movement for decades (though in my case, I had resigned from DSA years ago, rather than continuing to fight inside an organization that was gradually moving away from the Harrington/Howe conception). Whether the results will yield anything positive in the real world was hardly a concern. JoAnn Mort is an editorial board member of Dissent, a co-founder of the Democratic Socialists of America and a former vice-chair (and a long-time board member) of Americans for Peace Now. Jo Ann Mort is CEO of Change Communications and vice chair of Americans for Peace Now. Thanks to Jo Ann Mort for this eloquent column. I am a long time – since 1991 – member of DSA. I am crushed by the recent DSA direction, although i should have seen it coming.